The hot spring which wells ups to the quiet ravine for several minutes from the foot of a hakusan, and hakusan road-through-a-forest chugu toll gate this side.The hot spring of discovery about 1300 years ago is a noted spring it is supposed that it is especially called "a gastroenteric hot spring" and is effective against a gastric ulcer of a noted spring.That it cannot overlook on a road through a forest, a Jadani canyon and eight waterfalls are the sightseeing in the hot spring of the Mikata Iwatake mountain climbing and an Oyadani, and it.All waterfalls are touch called the mecca of a waterfall with personality and beautifully.The promenade from the conservation-of-nature center back to a Jadani canyon also seemed to be pleasant. 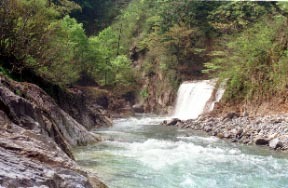 The left bank is a "hot spring of Oyadani" open-air bath to a nurse KA waterfall and the opposite shore. A photograph is a Nishiyama hot spring rice-gruel set. Gastroenteropathy, a gastric ulcer, a duodenal ulcer, chronic gastric catarrh, chronic intestinal catarrh, a cut, a burn, chronic cardiopathy, etc. They are open-air bath "hot spring of Oyadani" mixed bathing, and no charge in front of a nurse KA waterfall. The hot spring which is effective against a skin disease, and a hand become a crane crane, so that it says that the leprosy patient treated the hot spring of the Oyadani a long time ago. Osaka -> it is Hokuriku Line and a limited express and is a 2-hour and 39-minute -> Kanazawa station. About 1 hour and 20 minutes after Kanazawa I.C. About 1 Hour after Komatsu I.C. 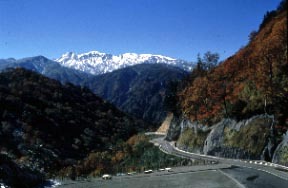 About 1 hour and 40 minutes after Fukui north I.C.